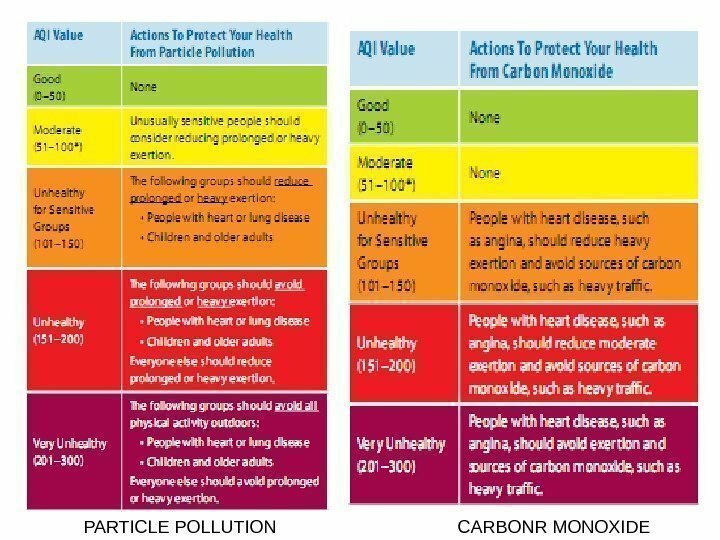 Air quality standards • Air quality standards establish permissible rates of harmful substances both at production area (intended for industrial enterprises, pilot plants, research institutes, etc), and atresidential areas (intended for housing, public buildings and facilities, settlements). 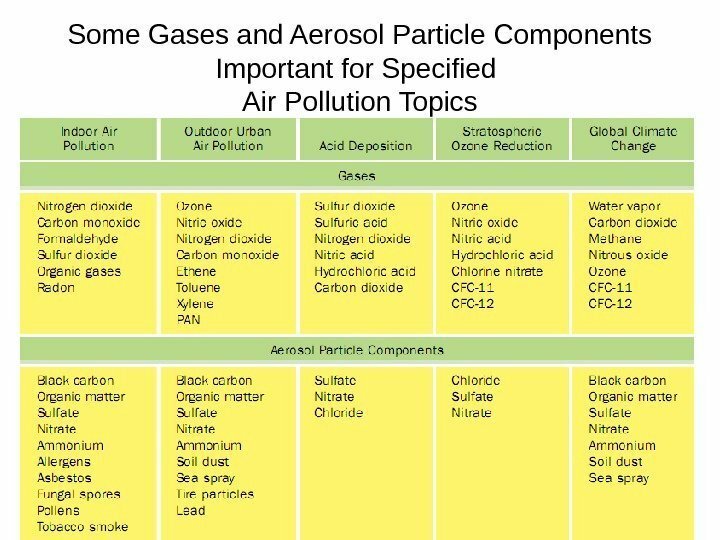 Air pollutants may be divided into two broad categories, natural and human-made (synthetic). 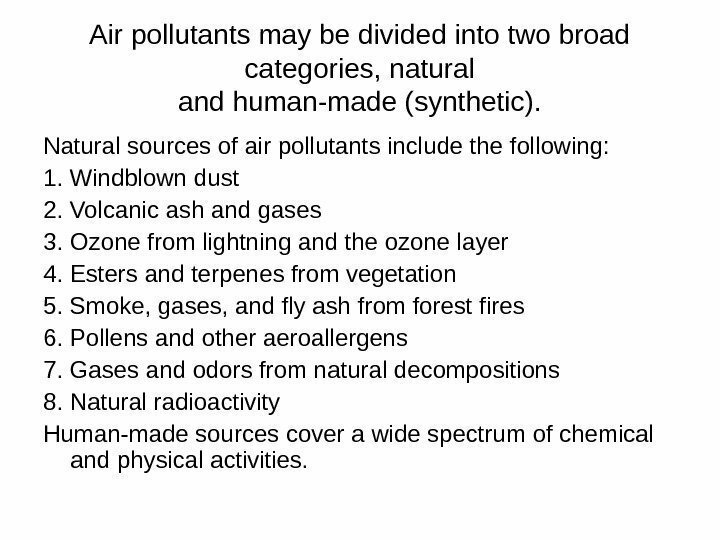 Natural sources of air pollutants include the following: 1. Windblown dust 2. 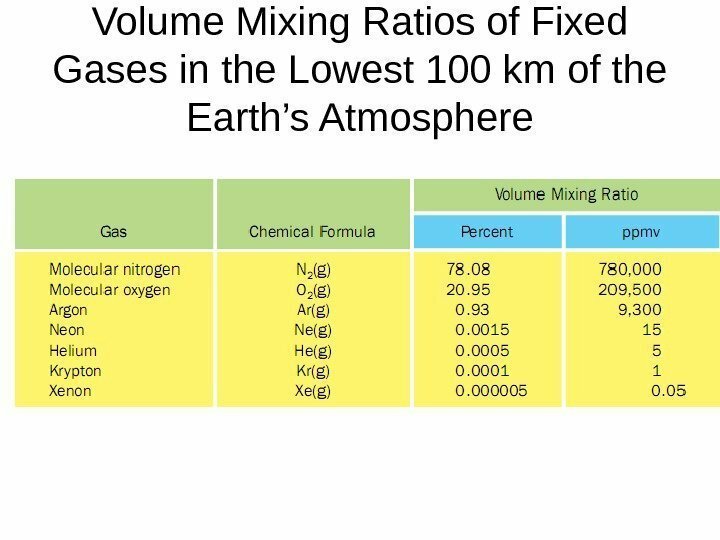 Volcanic ash and gases 3. 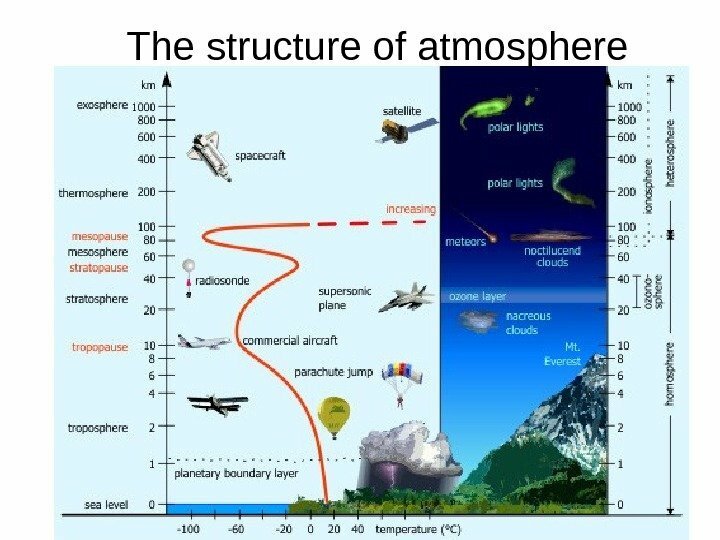 Ozone from lightning and the ozone layer 4. Esters and terpenes from vegetation 5. Smoke, gases, and ﬂy ash from forest ﬁres 6. Pollens and other aeroallergens 7. Gases and odors from natural decompositions 8. Natural radioactivity Human-made sources cover a wide spectrum of chemical and physical activities. 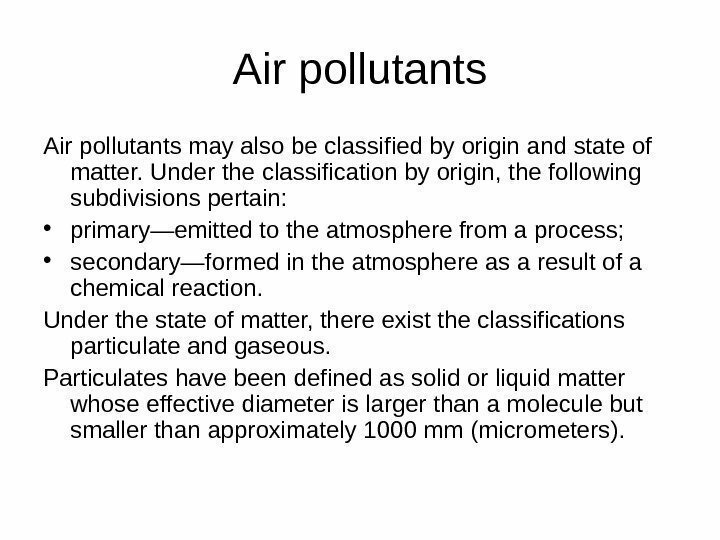 Air pollutants may also be classiﬁed by origin and state of matter. 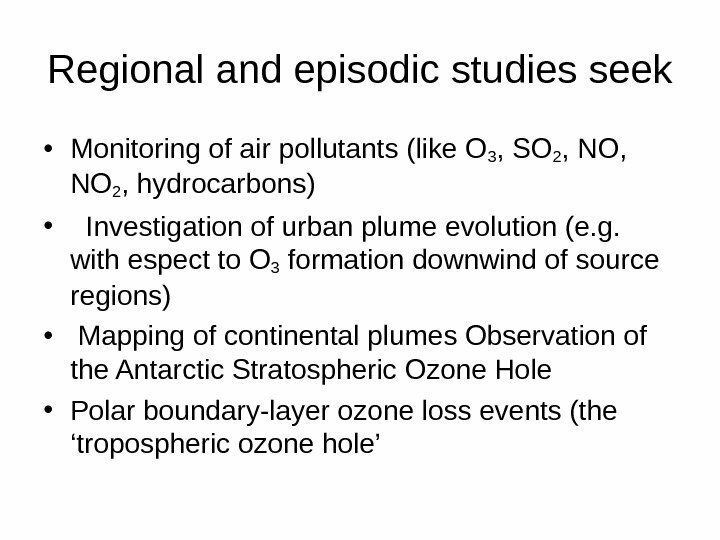 Under the classiﬁcation by origin, the following subdivisions pertain: • primary—emitted to the atmosphere from a process; • secondary—formed in the atmosphere as a result of a chemical reaction. 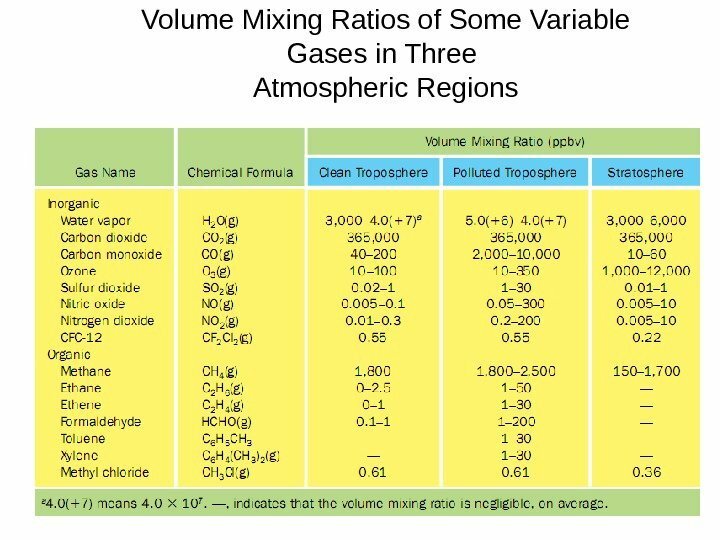 Under the state of matter, there exist the classiﬁcations particulate and gaseous. Particulates have been deﬁned as solid or liquid matter whose effective diameter is larger than a molecule but smaller than approximately 1000 mm (micrometers). 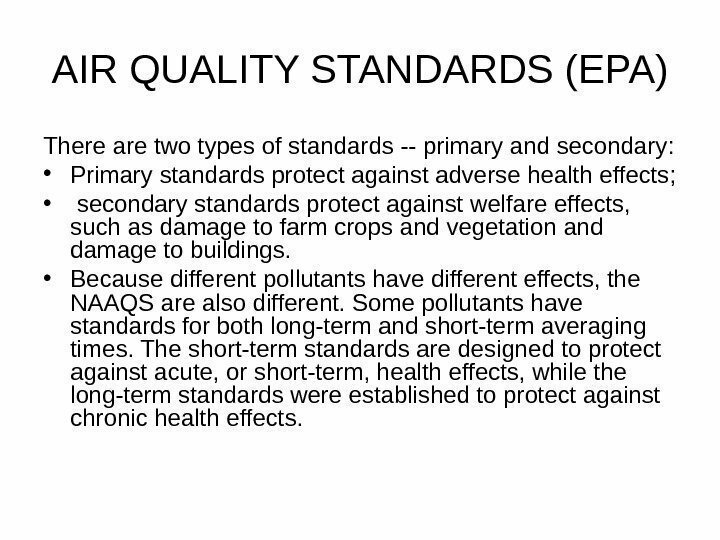 AIR QUALITY STANDARDS (EPA) There are two types of standards — primary and secondary : • Primary standards protect against adverse health effects; • secondary standards protect against welfare effects, such as damage to farm crops and vegetation and damage to buildings. 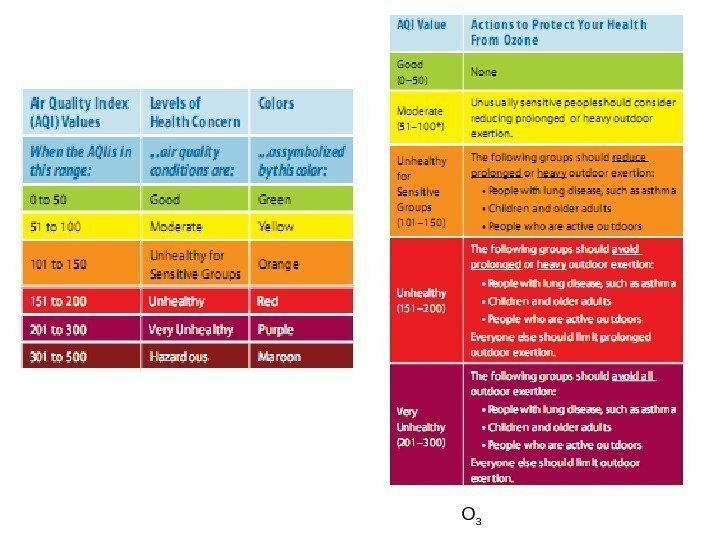 • Because different pollutants have different effects, the NAAQS are also different. Some pollutants have standards for both long-term and short-term averaging times. The short-term standards are designed to protect against acute, or short-term, health effects, while the long-term standards were established to protect against chronic health effects. 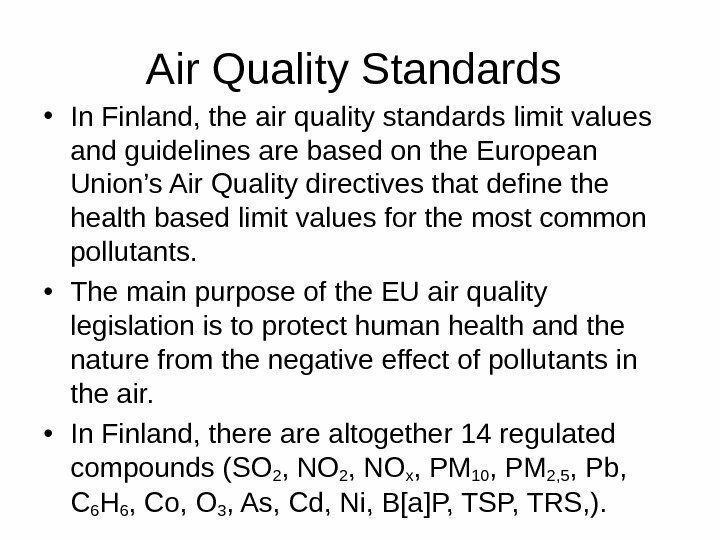 Air Quality Standards • In Finland, the air quality standards limit values and guidelines are based on the European Union’s Air Quality directives that define the health based limit values for the most common pollutants. 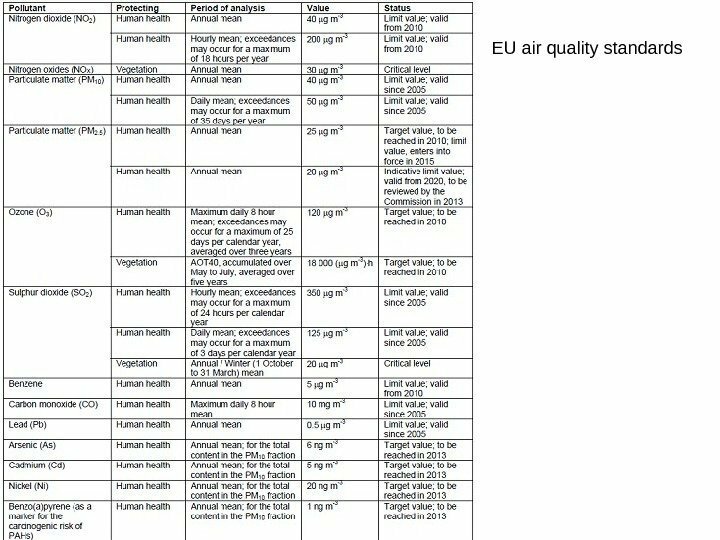 • The main purpose of the EU air quality legislation is to protect human health and the nature from the negative effect of pollutants in the air. 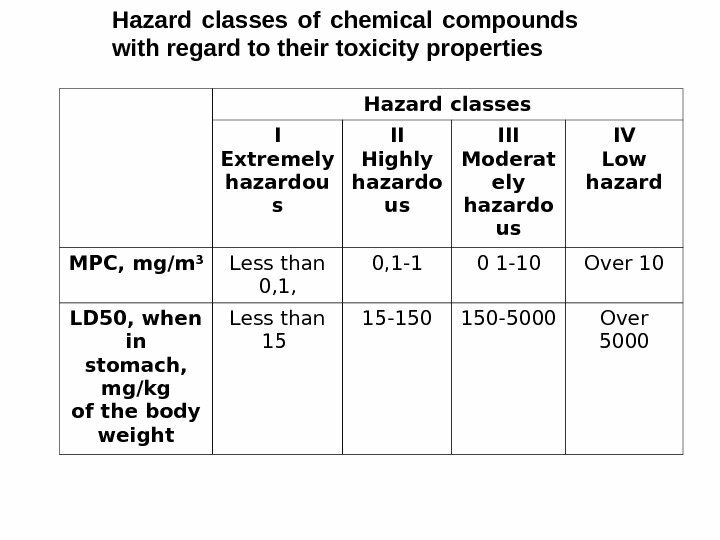 • In Finland, there altogether 14 regulated compounds (SO 2 , NOx , PM 10 , PM 2, 5 , Pb, C 6 H 6 , Co, O 3 , As, Cd, Ni, B[a]P, TSP, TRS, ). 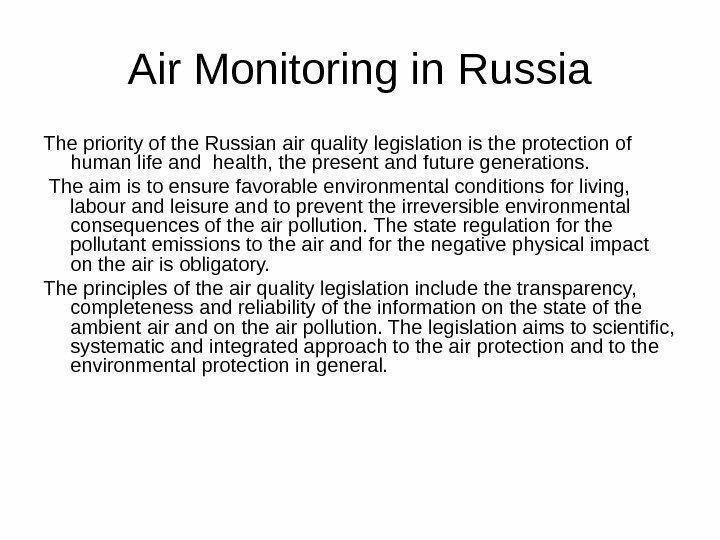 Air Monitoring in Russia The priority of the Russian air quality legislation is the protection of human life and health, the present and future generations. The aim is to ensure favorable environmental conditions for living, labour and leisure and to prevent the irreversible environmental consequences of the air pollution. The state regulation for the pollutant emissions to the air and for the negative physical impact on the air is obligatory. 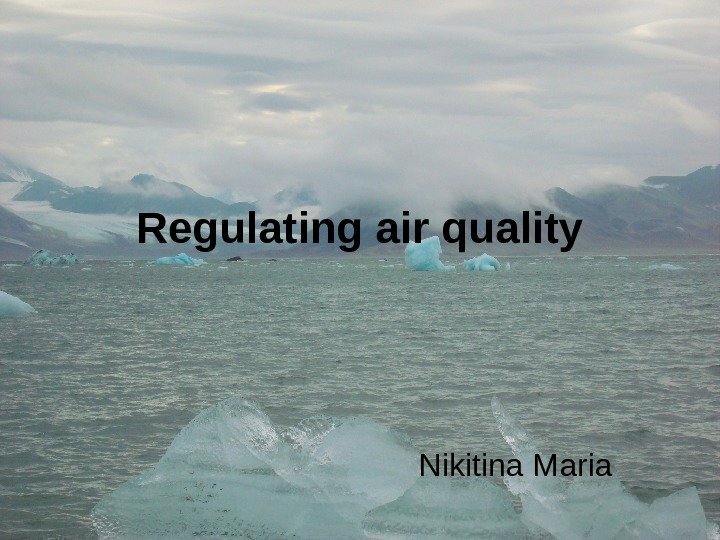 The principles of the air quality legislation include the transparency, completeness and reliability of the information on the state of the ambient air and on the air pollution. The legislation aims to scientific, systematic and integrated approach to the air protection and to the environmental protection in general. 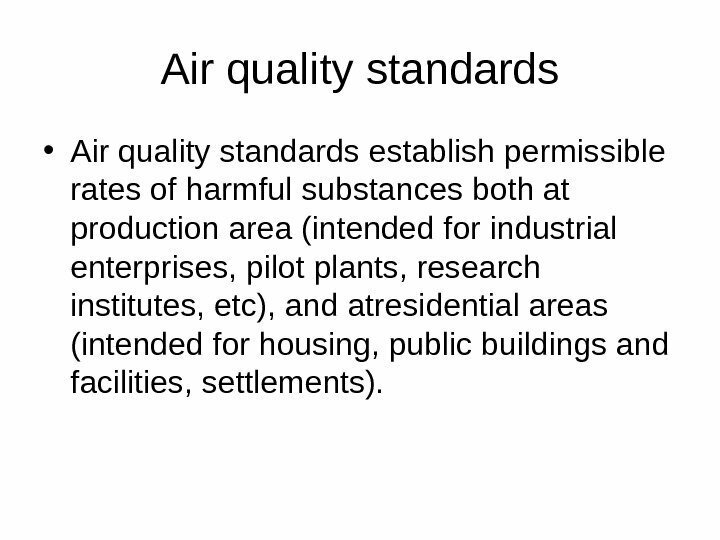 Air quality standards determine allowable limits for hazardous substances both in the industrial and residential areas. 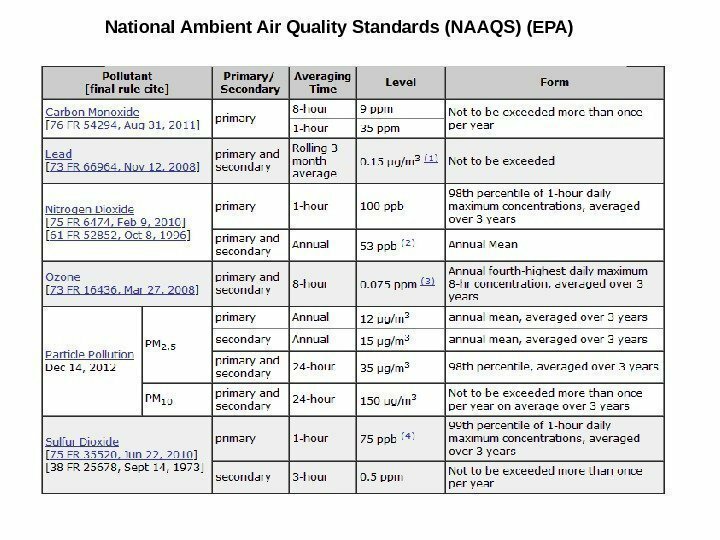 There is a range of air quality standards: • Maximum allowable concentration of hazardous substance in the working area air (MACwa) is a concentration which, with daily (except weekends) work of 8 hours a day or of other duration, but not longer than 41 hours a week, throughout the length of service should not cause a disease or any deviation in the state of health detected by modern research methods in the process of work or during remote periods of life of current or future generations. • Maximum allowable concentration , maximum non-recurrent (MACmnr) is a concentration of a hazardous substance in the air of a locality which does not cause, when inhaled for 20 minutes, any reflex reactions in the human body. 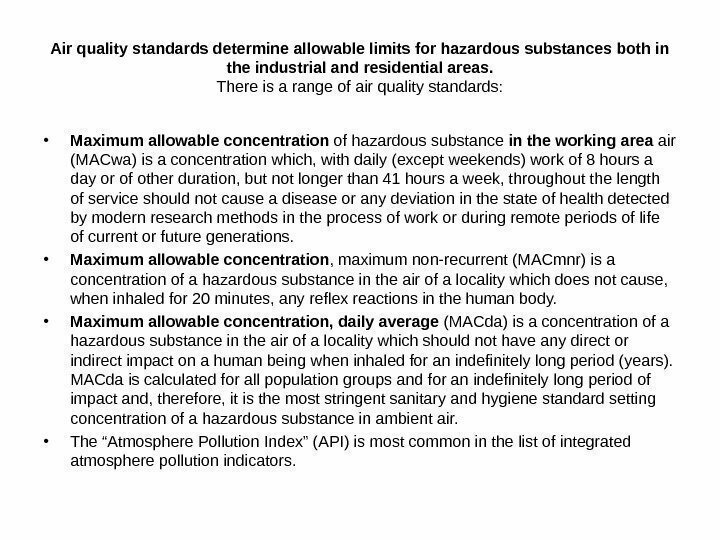 • Maximum allowable concentration, daily average (MACda) is a concentration of a hazardous substance in the air of a locality which should not have any direct or indirect impact on a human being when inhaled for an indefinitely long period (years). 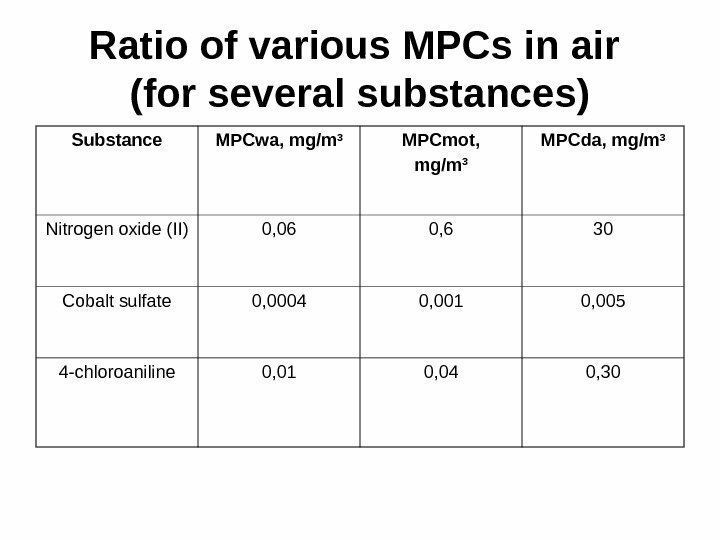 MACda is calculated for all population groups and for an indefinitely long period of impact and, therefore, it is the most stringent sanitary and hygiene standard setting concentration of a hazardous substance in ambient air. 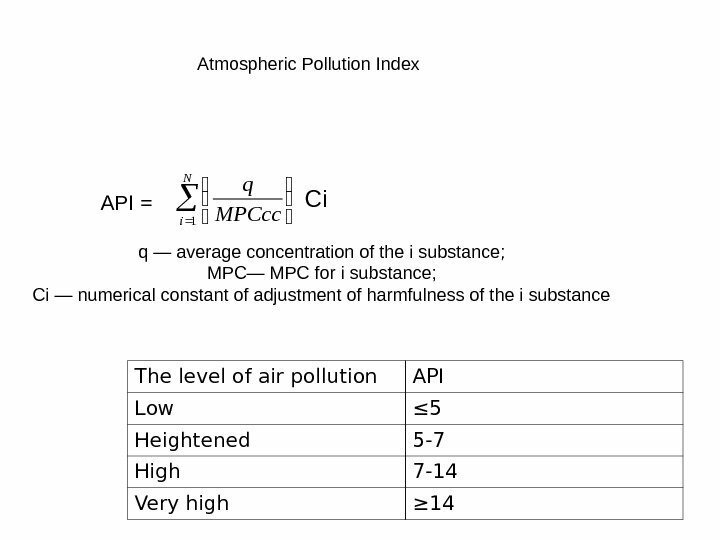 • The “Atmosphere Pollution Index” (API) is most common in the list of integrated atmosphere pollution indicators. 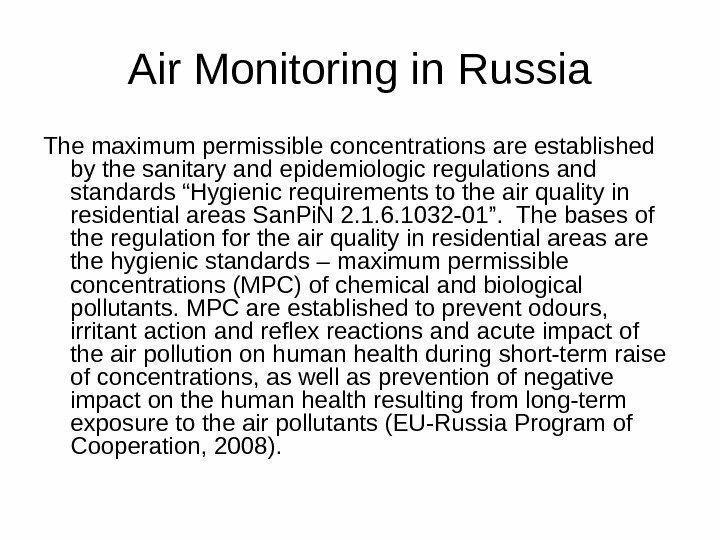 Air Monitoring in Russia The maximum permissible concentrations are established by the sanitary and epidemiologic regulations and standards “Hygienic requirements to the air quality in residential areas San. Pi. N 2. 1. 6. 1032 -01”. 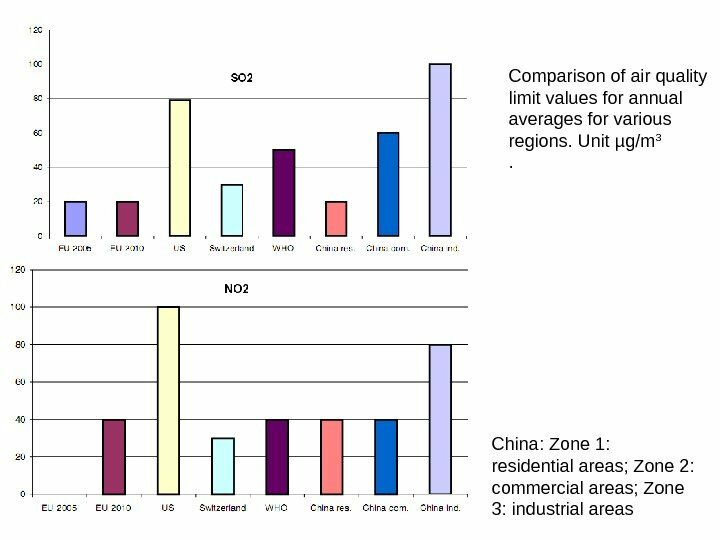 The bases of the regulation for the air quality in residential areas are the hygienic standards – maximum permissible concentrations (MPC) of chemical and biological pollutants. 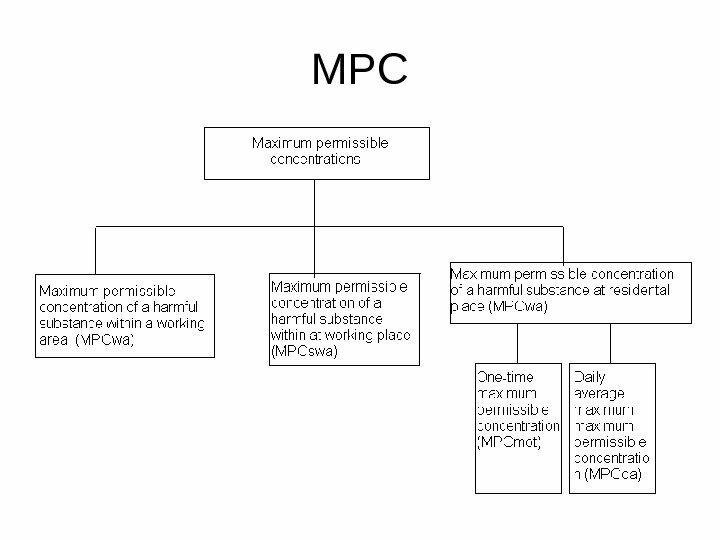 MPC are established to prevent odours, irritant action and reflex reactions and acute impact of the air pollution on human health during short-term raise of concentrations, as well as prevention of negative impact on the human health resulting from long-term exposure to the air pollutants (EU-Russia Program of Cooperation, 2008). 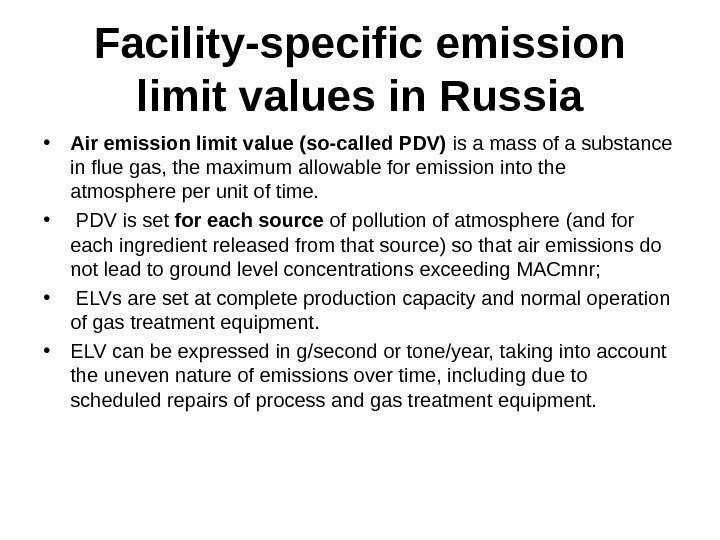 Facility-specific emission limit values in Russia • Air emission limit value (so-called PDV) is a mass of a substance in flue gas, the maximum allowable for emission into the atmosphere per unit of time. 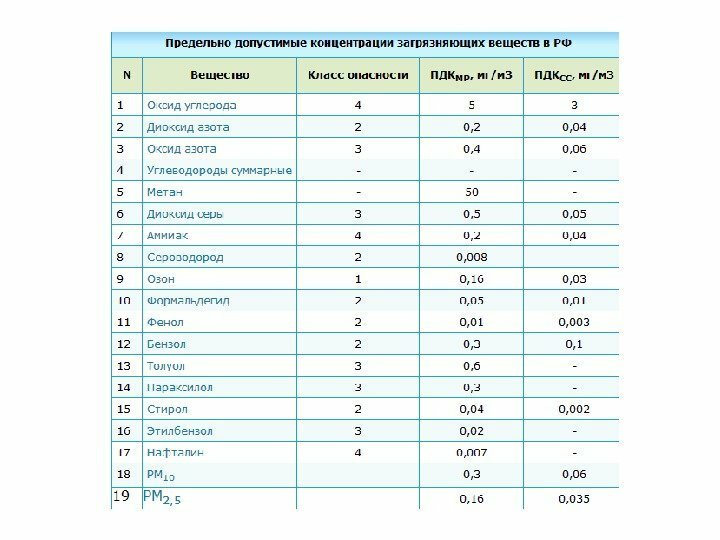 • PDV is set for each source of pollution of atmosphere (and for each ingredient released from that source) so that air emissions do not lead to ground level concentrations exceeding MACmnr; • ELVs are set at complete production capacity and normal operation of gas treatment equipment. 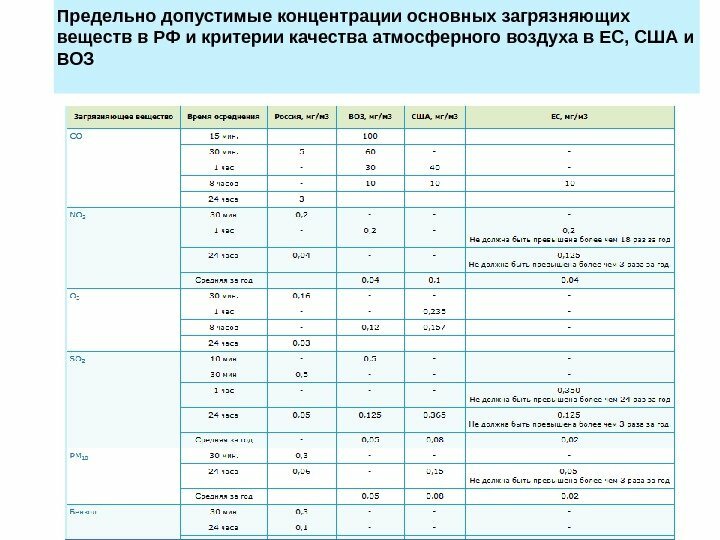 • ELV can be expressed in g/second or tone/year, taking into account the uneven nature of emissions over time, including due to scheduled repairs of process and gas treatment equipment. 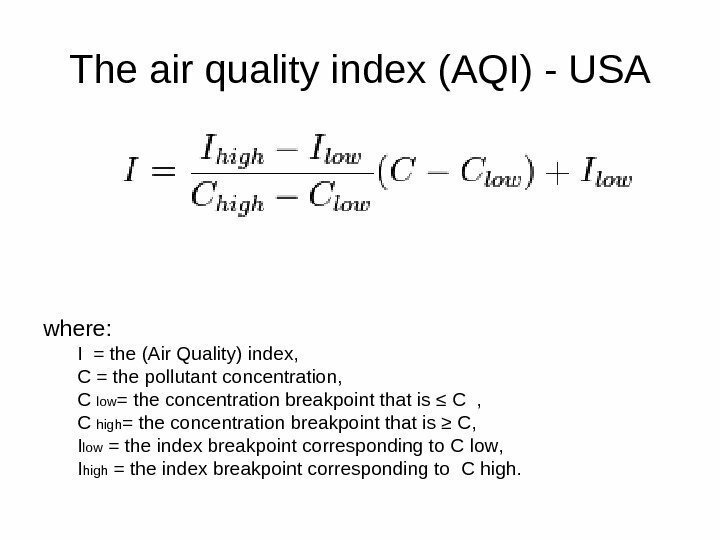 The air quality index (AQI) — USA where: I = the (Air Quality) index, C = the pollutant concentration, C low = the concentration breakpoint that is ≤ C , C high = the concentration breakpoint that is ≥ C , I low = the index breakpoint corresponding to C low , I high = the index breakpoint corresponding to C high. 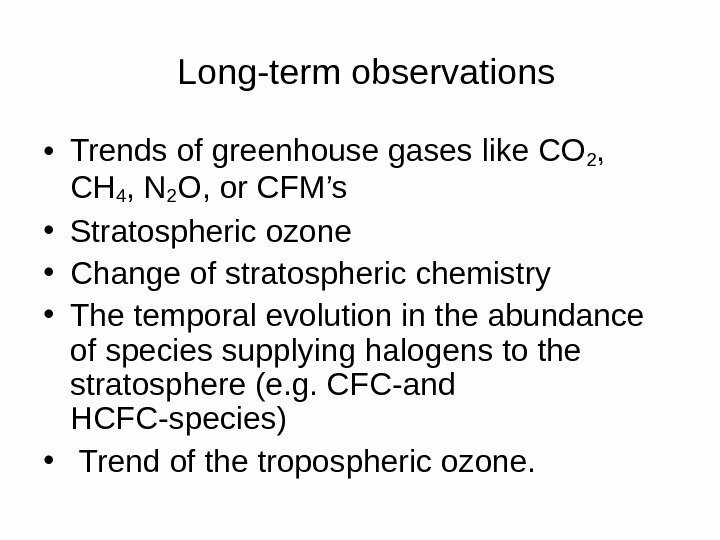 Long-term observations • Trends of greenhouse gases like CO 2 , CH 4 , N 2 O, or CFM’s • Stratospheric ozone • Change of stratospheric chemistry • The temporal evolution in the abundance of species supplying halogens to the stratosphere (e. g. CFC-and HCFC-species) • Trend of the tropospheric ozone. 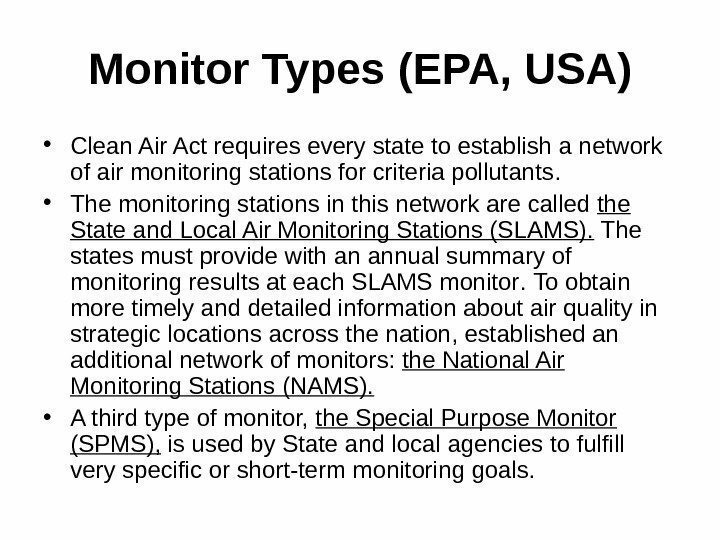 Monitor Types (EPA, USA) • Clean Air Act requires every state to establish a network of air monitoring stations for criteria pollutants. • The monitoring stations in this network are called the State and Local Air Monitoring Stations (SLAMS). The states must provide with an annual summary of monitoring results at each SLAMS monitor. 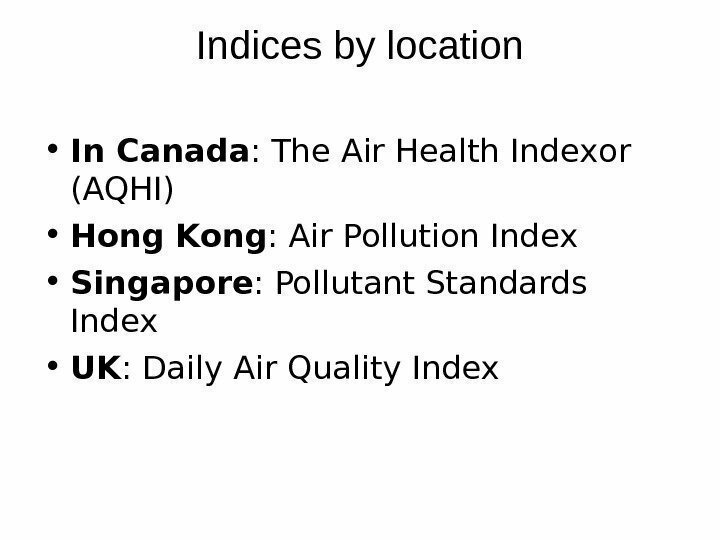 To obtain more timely and detailed information about air quality in strategic locations across the nation, established an additional network of monitors: the National Air Monitoring Stations (NAMS). • A third type of monitor, the Special Purpose Monitor (SPMS), is used by State and local agencies to fulfill very specific or short-term monitoring goals.